Moulin Roty Les Jolis Pas Beaux Dog Comfort..
Moulin Roty Les Jolis Pas Beaux Turning Ani..
Moulin Roty Les Jolis Pas Beaux Soft Cloth ..
Moulin Roty Les Jolis Pas Beaux Sheep Doll ..
Moulin Roty Les Jolis Pas Beaux Sheep Hangi..
Moulin Roty Les Jolis Pas Beaux Sheep Doudo..
Moulin Roty Les Jolis Pas Beaux Baby Slippe..
Moulin Roty Les Jolis Pas Beaux Child Savin..
Moulin Roty Les Jolis Pas Beaux Baby Meal C..
Moulin Roty Les Jolis Pas Beaux Baby Meal 4..
Moulin Roty Les Jolis Pas Beaux Hanging Bab..
Moulin Roty Les Jolis Pas Beaux Cat Hanging..
Moulin Roty Les Jolis Pas Beaux Doudou Lapi..
Moulin Roty Les Jolis Pas Beaux Health Book..
Moulin Roty Les Jolis Pas Beaux Little Dog ..
Moulin Roty Les Jolis Pas Beaux Luc & L..
Moulin Roty Les Jolis Pas Beaux Milk Tooth ..
Moulin Roty Les Jolis Pas Beaux Mouse Backp.. In the middle of a forest clearing, in the shelter of a venerable oak, all cosily snuggled together, lives an adorable family of rabbits and mice - the Mirabelle family. 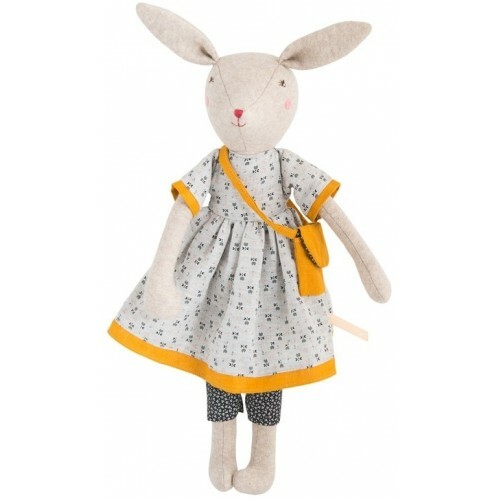 Rose the Mummy rabbit is made of marled jersey and wears a little cotton and linen dress, country printed with matching handbag. A timeless soft toy with an embroidered face, gorgeous pink cheeks and flowery eyes dressed in real fabric clothes, to dress and undress, to take out and about. Dimension: 40 cm. Materials: Cotton, acrylic, elastane, linen. Wash at 30 degrees on a delicate cycle. Do not tumble dry. Suitable from birth.